So you read an article saying a lot of health problems occur due to spending hours everyday sitting in front of a computer? Luckily, we now have a lot of sit stand desks and stand up workstations to choose from! 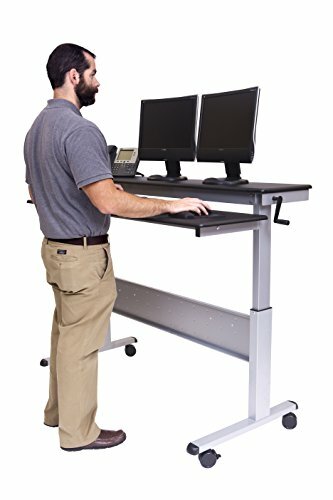 I recommend the Ergotron WorkFit-S desks because they allow you to easily switch between standing and sitting…come on, it can be tiring to stand for hours and you may wanna sit down and drink a cup of coffee while doing some light web browsing. 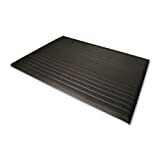 By the way, do get this anti fatigue mat to relief stress from your feet if you intend to stand for hours at work! Anti-fatigue mat offers 3/8″ thick vinyl foam structure to provide support that reduces fatigue and discomfort. ribbed surface increases safety. 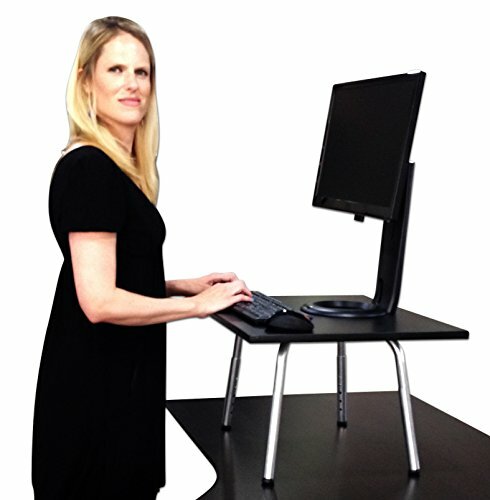 With this affordable stand up computer desk its easy to achieve long lasting health benefits like burning more daily calories, boosted productivity, improved posture and a reduced risk of heart problems. 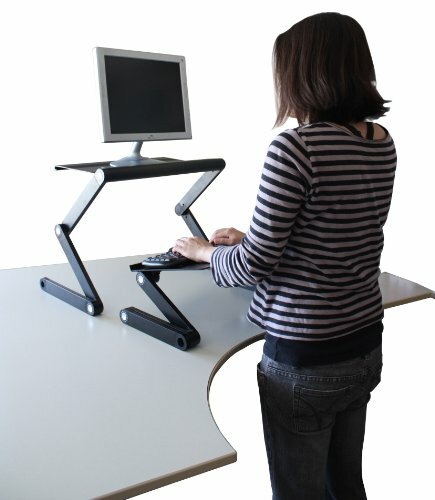 The desk can be positioned at multiple heights from sitting to standing. The desk’s shelves have a generous 39.4″ wide work surface with a 14″ deep top shelf and a 16″ deep lower shelf. The shelves have 4.9″ of separation; this allows for a unique 2-tiered system that puts your monitor and keyboard at the proper separated viewing and working heights. Everything needed for assembly is included, Overall dimension: 39.4″W x 28.8″D x 34.1-46.1″H. Model and props shown are not included. 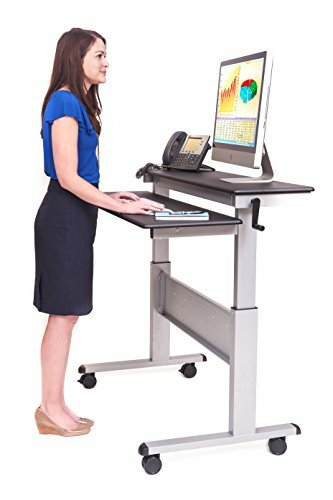 With the innovative crank adjustable height stand up desk its easy to achieve long lasting health benefits like burning more daily calories, boosted productivity, improved posture and a reduced risk of heart problems. The crank allows for effortless on the fly adjustment from sitting to standing. The standing computer desk’s shelves have a generous 59″ wide work surface with a 14″ deep top shelf and a 16″ deep lower shelf. 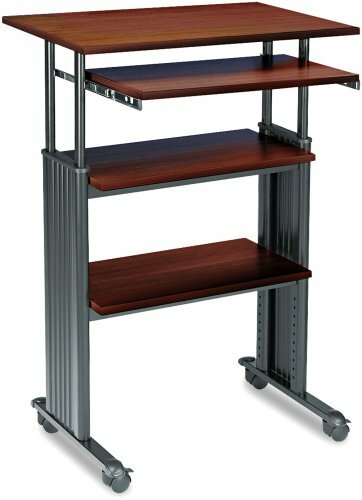 The shelves have 3.75″ of separation; this allows for a unique 2-tiered system that puts your monitor and keyboard at the proper separated viewing and working heights. Everything needed for assembly is included, Overall dimension: 59″W x 28.5″D x 33.5-45.25″H. Model and props shown are not included. Small standup desk with a 47″ wide work surface with a 14″ deep top shelf and a 16″ deep lower shelf. Overall dimension: 47″W x 28.5″D x 33.5-47.5″H. 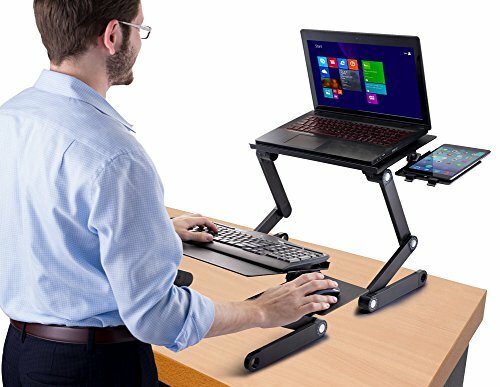 If you do not have space for a new stand up workstation desk, and prefer to use your existing table while standing up, check out these adjustable height laptop stands. 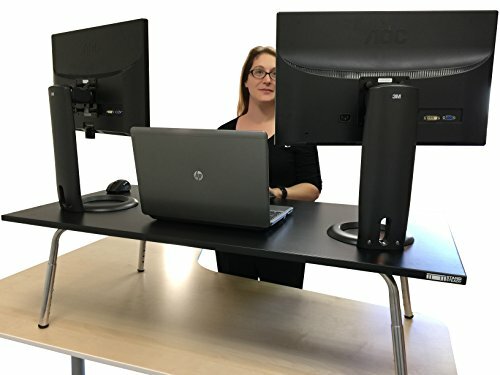 They allow you to convert any desks into a standing computer desk, so that you can spend less unhealthy time sitting down while working. 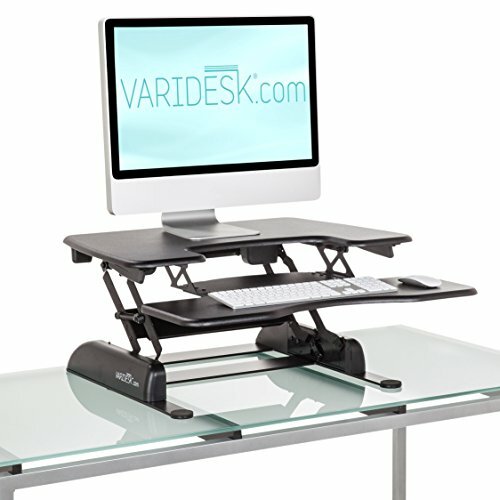 The VARIDESK Pro Plus adjustable riser sits on top of your existing desk, allowing you to switch from a seated to standing position quickly and easily. The new lifting keyboard tray ensures ergonomic comfort for your arms and shoulders whether sitting or standing. Studies prove that standing up for part of the workday can increase your calorie burn and raise your energy levels, metabolism, and productivity. Plus, it can reduce your risk factors for diabetes, high blood pressure and cardiovascular disease. 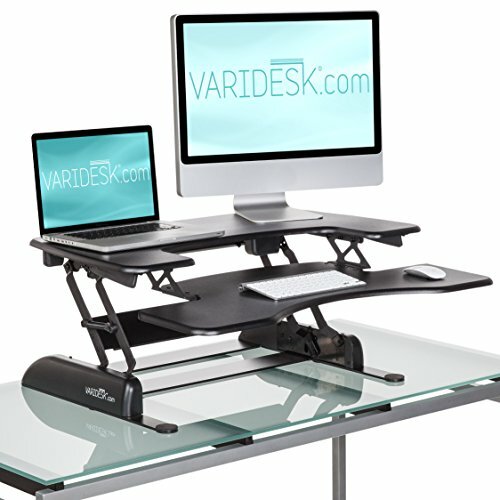 VARIDESK Pro Plus is the perfect size for workstations with dual monitors or docking stations. Need a multifunctional laptop workstation? Or a TV tray for food / snack? Even a bed tray desk to enjoy your breakfast? We have them all cover. 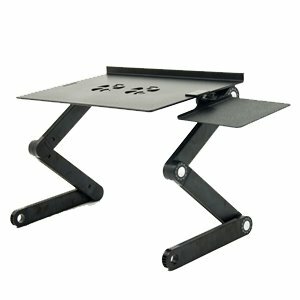 This adjustable VENTED aluminum laptop notebook table features air vented cavities design which reduce overheating on your laptop / notebook. The extraordinary locking button that can be set in full 360 degree angles to fit any body position, even laidback on your bed. Just hold the button on the joints, change the position, and release the button to lock it in place. Grooved table surface to prevent slippage, and collapsible frame for easy storage and carrying. Wrist guard added extra comfort. It weights 5 pounds and can support up to 30 pounds capacity. This adjustable VENTED aluminum laptop notebook table features air vented cavities design which reduce overheating on your laptop / notebook. The extraordinary locking button that can be set in full 360 degree angles to fit any body position, even laid back on your bed. Just hold the button on the joints, change the position, and release the button to lock it in place. Grooved table surface to prevent slippage, and collapsible frame for easy storage and carrying. Wrist guard added extra comfort. It weights 5 pounds and can support up to 30 pounds capacity. 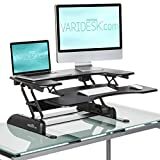 Combines 2 separate stands into a completely adjustable standing desk that converts any desk or table into a healthy, convenient standing desk. Includes a Keyboard Tray & Mouse Pad. We designed these new items to work together seamlessly and to become the ultimate ergonomic keyboard stand. The aluminum MONITOR STAND is adjustable in height from 0-2 feet. The panel rotates and can support loads under 13 lbs. Perfect for laptops & desktop monitors. Bonus: aluminum naturally dissipates heat & helps keep laptops cool. The ALL-NEW aluminum KEYBOARD TRAY holds keyboards at downward angle, letting your wrist droop down naturally while typing. Many agronomists conclude this is the healthiest position for your wrists to be in while typing. This is a simple, standing desk conversion that is easy to use and will help you reap the benefits of incorporating more standing in your daily life. Includes our BRAND NEW WorkEZ Keyboard Tray & Mouse Pad. We designed these new items to work together seamlessly and to become the ultimate ergonomic keyboard stand. The aluminum MONITOR STAND is adjustable in height from 0-2 feet. The panel rotates and can support loads under 13 lbs. Perfect for laptops & desktop monitors. 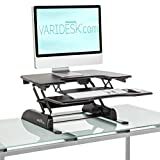 The Executive Stand Steady standing desk (patent pending) is comfortable, affordable, and compatible with your existing desk. 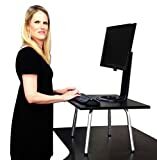 Simply place The Stand Steady on top of your existing desk, adjust it to your height, and you are ready to work standing up. It is large enough to hold two monitors plus it increases your desk space by 4.5 sq ft because you can put items below it. 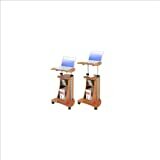 Small: Traveler Folding Stand up Desk (19.7″x11″) – small & portable! Medium: The Original Stand Steady (24″ x20″) perfect for smaller desks! 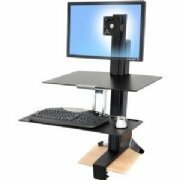 Large: The Executive Stand Steady desk (32″x22″) fits two monitors! 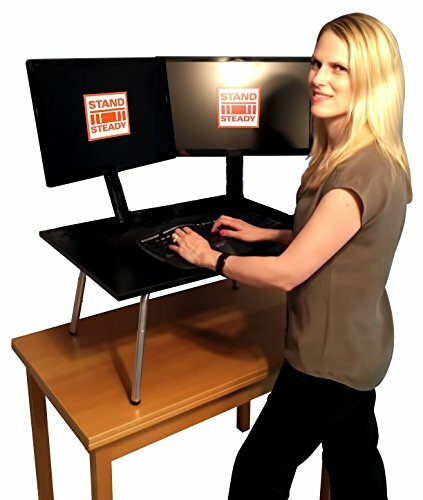 Extra Large: The Mega Stand Steady (47.5″x23.5″) complete desktop replacement! As recently reported in The Wall Street Journal , The New York Times , and The Washington Post , research shows that standing at work has numerous health benefits, including reducing back pain, burning extra calories, and improving overall health. 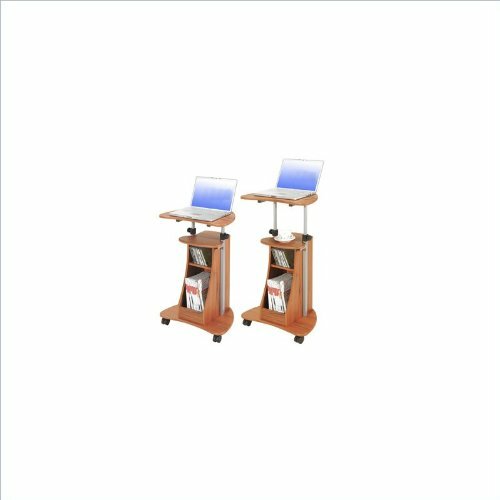 The Mega Stand Steady standing desk (patent pending) is comfortable, affordable, and compatible with your existing desk. 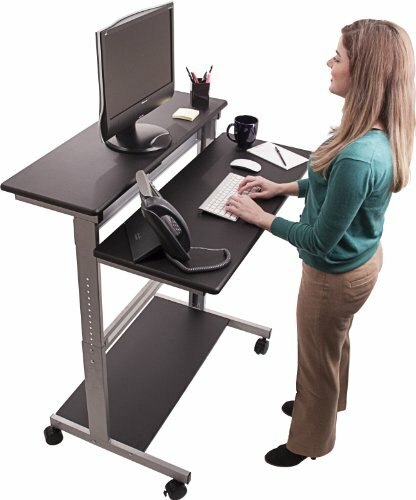 Simply place the Mega on top of your existing desk, adjust it to your height, and you are ready to work standing up. We call this “the complete desktop replacement” because it is large enough to completely cover most desks! Plus, you gain over 7.5 sq ft of desk area below it.